Range: Southwestern United States to Argentina. Habitat: Forest to tropical areas. Diet in the wild: Earthworms, termites, snails, lizards, snakes and mice. Also fruits,roots, nuts, and eggs. Diet in the zoo: Fruits, worms, vegetables. Weight 7 to 15 lb..
Color quite variable from cinnamon-buff to black with a distinctive mask defined by white marks above, below and behind the eyes. Tail is quite long, 13 to 27 inches, striped, and carried vertically. Ears are small and rounded, mostly hidden in the fur. Feet are generally like those of a raccoon, with bare soles, and powerful long front claws, plantigrade. Males will join female bands during breeding season and fend off challenging males. Coatis are active day and night. They spend their nights in trees, with several animals sharing the nest. While the male prefers to travel alone (and may be referred to as the coati mundi, or solitary coati), the females and their young tend to travel in bands of 4 to 50 individuals. New born coatis are altricial, or very immature at birth. 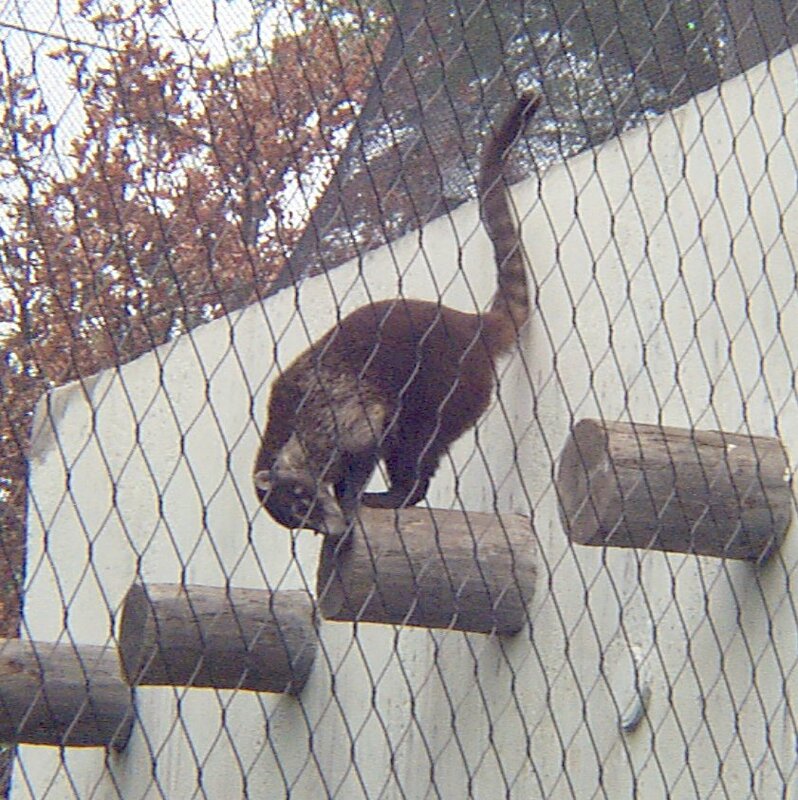 The coati is a social animal, so it is very vocal with a lot of snorts, grunts, screams, whines and chatters. Most of the day is spent foraging, but during the hottest part of the day, they tend to nap in trees. Coatis swim well and climb excellently. They use the tail for balancing on branches and for slowing down the descent of the tree. The stout claws and long snout work, and used together for food gathering, they have an excellent sense of smell and we will see them snuffling along the ground. When they smell prey in the ground they will stop and dig there. They can also push dirt with their snouts. When coatis find a tree of a fruit they will visit the tree repeatedly until it is stripped. They are also very active hunters. The canines of the males are quite impressive and are used as warning signals, during which the dominant male will rear up. If the challenging male ignores that signal, serious fights may occur with injury to both combatants. 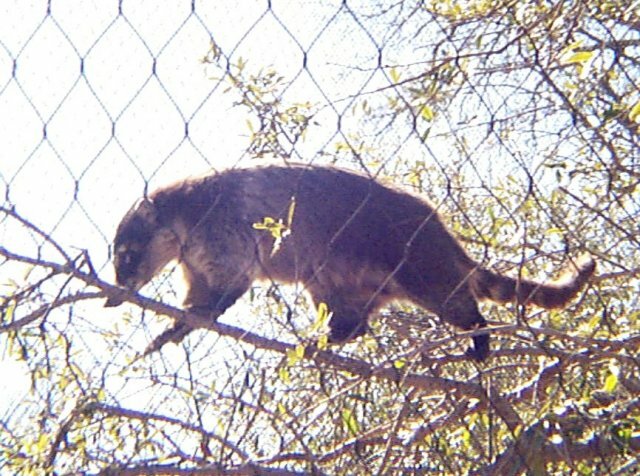 The Coatis are excellent climbers and can often be seen up trees or on the roof of the building adjacent to their exhibit. 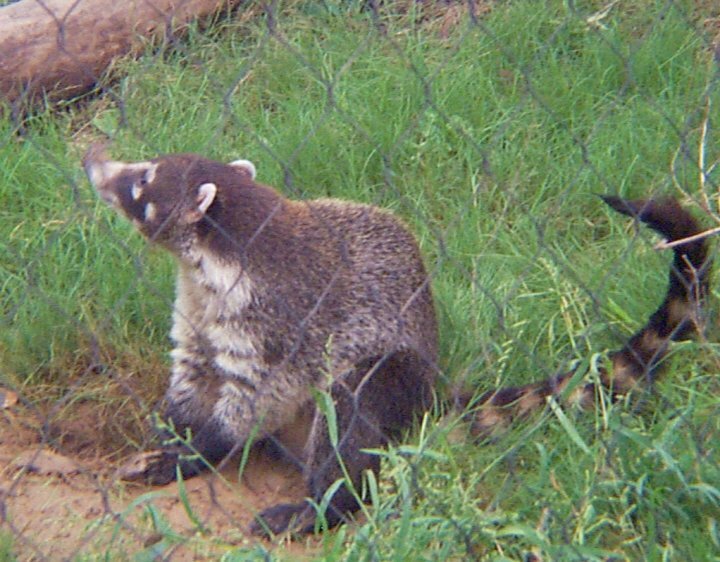 Coatis came from Central America and Mexico. 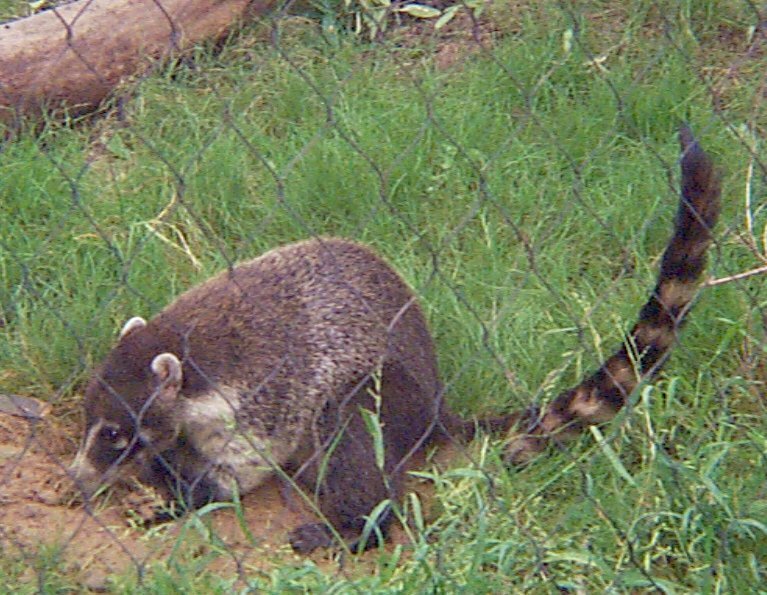 About 1900, coatis crossed the border into Texas, probably because their predators were exterminated. I never got to see the coati at the zoo but from what I have read, it is like a raccoon and pretty social, not with humans but with their own group. It is a great climber. They live in woodlands of Central America and Mexico. Now the coatis' range and habitat is grasslands, dense forest, wet jungles and deserts in Southwestern United States through Argentina. Some coatis like a lot bananas, they are very curious and the zoo people hide some peanuts and raisin in the tree holes to keep them from getting bored. Coatis usually live 14 years.